I saw Brooklyn (John Crowley) on the weekend (at the Maple). The film is well directed, has very good acting by lead Saoirse (SEAR-sha) Ronan, is sentimental, and is very Irish. You’d think Brooklyn in the early 1950s was nothing but Irish. Last Tuesday at cheap night at Devonshire Cineplex I caught Legend (Brian Helgeland) about Britain’s infamous 1960s Kray twins. Tom Hardy of course was brilliant in portraying both Ronnie and Reggie Kray, sometimes in the same scene. But there are problems with the film. It concentrates too much on rock’em sock’em violence. It could have provided a wider context about 1960s Britain in which the Krays flourished. And as a period piece it succumbs to the usual tropes of a soundtrack playing music of the era, even though often well performed in nightclub scenes. On Netflix the other night I caught The Yellow Eyes of Crocodiles (Cécile Telerman, 2014) starring Julie Depardieu as Joséphine Cortes and Emmanuelle Béart as Iris Dupin. The story follows the travails of Joséphine, a poorly paid but brilliant translator who is finagled by her sister, Iris, a failing novelist, to write her next book. The story is a best-selling sensation and Iris, a megalomaniac, takes all the credit. Based on the Katherine Pancol novel, it’s a bit far-fetched but Depardieu and Béart’s performances are good. And on TCM recently I watched Alfred Hitchcock’s 1941 Suspicion. If you ever want to see Cary Grant (Johnnie Aysgarth) out of character as a debonair charmer this is the movie. Here he’s diabolical or at least comes across that way. Hence the title. I hadn’t watched a film at Cineplex in awhile and was pleased that there are now pre-movie warnings to the audience not to do obnoxious like kicking the backs of seats. It’s been a long time coming and Canadian theatres have trailed American ones in this regard. The Maple Theater has a great pre-movie short featuring George Lucas, talking about his frustrations with other moviegoers, which turn out to be, sure enough, the same as ours. But what is with all the Cineplex commercials? There were perhaps as many as 20 coming at you staccato-like prior to the feature attraction. It’s fall film season heading into Christmas – the prime time of the year to catch films slated for Oscar buzz, and what have I been doing? Not going to see them. There are several reasons. One is the timing. I was travelling a lot this fall and in Europe and in a country where English is not the first language. So after Spectre (Sam Mendes) premiered in London Oct. 26 and there was perhaps a chance to catch it in the language of the country I was in, no problem, since who really needs translation for a Bond film? But alas, the movie’s almost over the top hype turned me off, and the charms of medieval Europe allowed little time for the nearest multiplex…..The Danish Girl (Tom Hooper) might have been a film I’d have seen in another time and place. But earlier this fall I saw a movie with the same theme, The New Girlfriend (François Ozon, 2014 – see Sept. 25 post). And with the Bruce/Caitlyn Jenner story all over the news the theme of transgenderism just seemed a bit exhausted. …. The same, I might say, for Trumbo (Jay Roach). No offence to Bryan Cranston (as famed novelist Dalton Trumbo and Hollywood Blacklist victim) and Helen Mirren. And although Dalton Trumbo was a great writer (just read his Johnny Got His Gun) the theme of Hollywood blacklisting has been done time and again…. How about Carol (Todd Haynes)? You can’t pick up a newspaper or digital magazine these days without reading a story about Cate Blanchett (whom the media seems determined to make into the starriest of current actresses) in the leading role of Carol, based on the Patricia Highsmith novel The Price of Salt. I’m a fan of Highsmith and the story, especially set in early 1950s New York, seems intriguing from the perspective of the then taboo attraction of one woman for another. But, again, the subject has been done before……Brooklyn (John Crowley), also set in generally the same era, depicts the Irish immigrant experience to the U.S. Nothing against the theme, I just can’t get too worked up about seeing it…. Bridge of Spies (Steven Spielberg) is a film I’d normally be interested in seeing, at least in terms of the topic – the height of the Cold War, and West and East Berlin the fulcrum of then Soviet – US tension. But I’m not a particular fan of Spielberg. There is a certain patina to his films that I want to call Disneyesque only they’re Spielbergesque.……Do I want to see The Big Short (Adam McKay) and depressingly return to recent history when the financial bottom was falling out of our economy? I’ve read umpteen explanations of the housing crash so do I want to see it explained on screen, albeit dramatically portrayed with a stellar cast?..... Ditto Spotlight (Thomas McCarthy). The Catholic Church abuse scandal was horrific and I've read copious amounts about it. Do I want to revisit it in a film?.....So Stang, what do you want to see? Well, there’s Legend (Brian Helgeland). I’m a huge fan of Tom Hardy, who masterfully plays the dual roles of Britain’s infamous Kray brothers (twins) criminal gang in London’s Swinging Sixties. What’s not to like? And there’s Youth (Paolo Sorrentino). 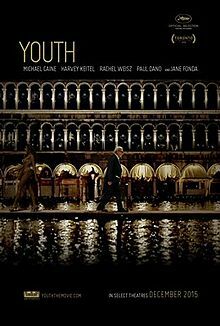 This film seems a lot like Sorrentino’s The Great Beauty (2013), a meditation on life and its multifaceted charms and illusions, and starring two of my favourite actors, Michael Caine and Harvey Keitel.